There is definitely a ton of anticipation building around the release of the live-action version of Beauty and the Beast. It's not hard to be apart of the hype. I include myself in the bubble of fans that are waiting for their childhood memories come to life on the big screen. Although it won't be exactly like the original animated feature (which as a fan I am mentally preparing for lol), it has still been fun to see Disney remake some of our nostalgic favorites. It's no secret that I'm a huge Disney fan. So much so that it was almost like a match made in Heaven when I was asked to partake in a styled shoot based on the upcoming version of this classic tale. Although the shoot was unfortunately canceled, Clare from Clare Murray Photography was kind enough to take some shots of the work we and Lilly at The Starfish Cottage created for the shoot. So in the words of Lumiere, 'it is with deepest pride and greatest pleasure" that I welcome you to Be Our Guest as I proudly present the photos. Following the advice of the enchanted objects, I asked about the grey stuff. This, of course, was their reply. 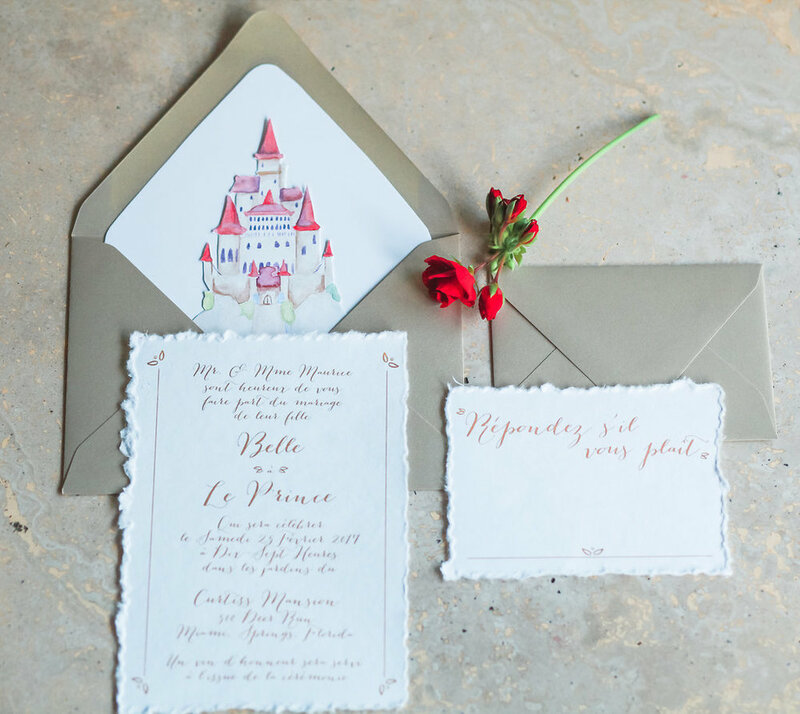 Our invitation suite not only gives the rich, story book feeling, but keeps an artful eye with our own depiction of Beast's Castle. 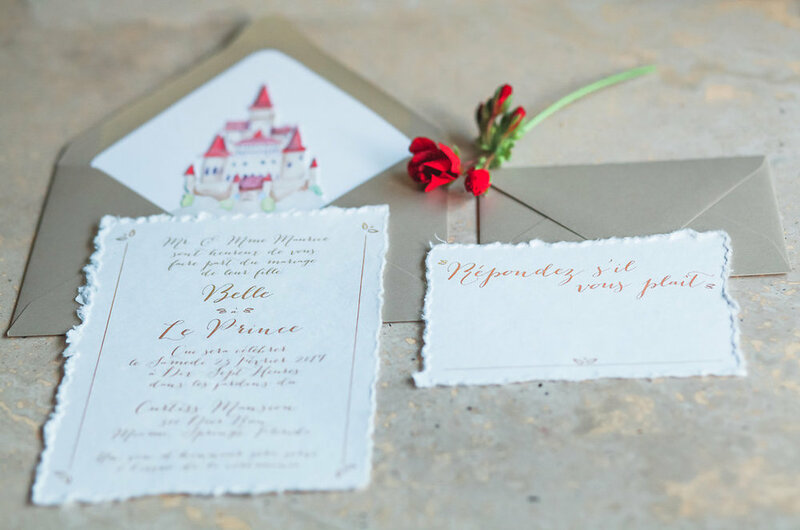 A MAJOR shoutout is in order for Yasmin from Maison Francis Design Co. for translating and giving us the invitation text in French. 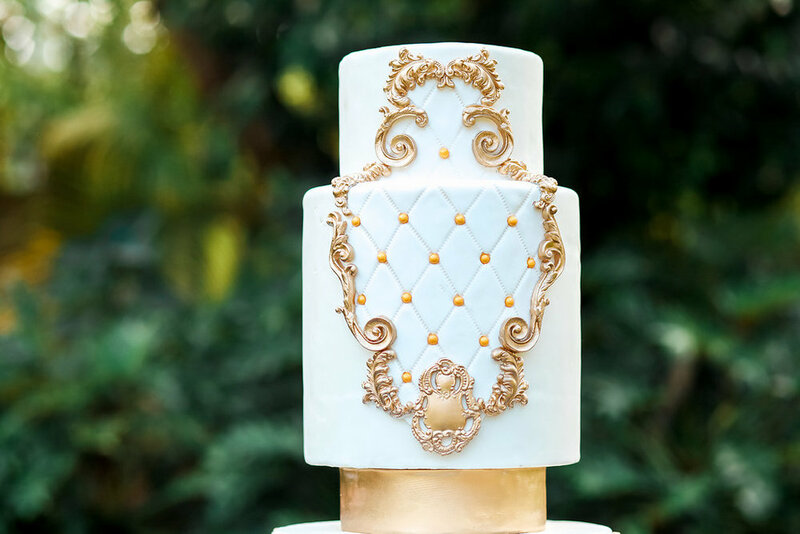 The details on this gorgeous cake by Lilly at The Starfish Castle are to die for. Jaclyn and Kyle were having an Aladdin Themed wedding with Mint and Lavender as their wedding colors. The invitation suite design they chose was simple and showcased Genie's lamp as the only imagery from the film. We used a basic, white card stock to capture the pastel wedding colors chosen by the couple. Curious to see how their big day turned out? 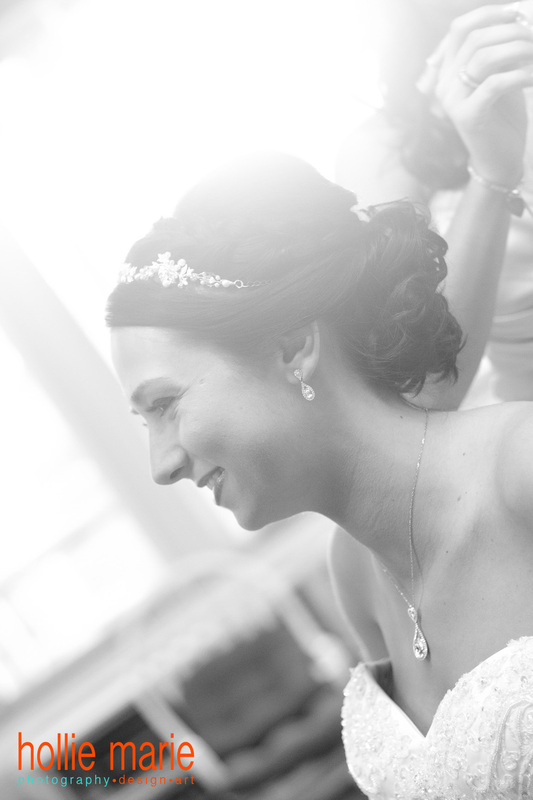 Check out some of the images taken by Hollie Marie Photography of Jaclyn and Kyle's special day. Who knows what would have happened in this story if Tiana had not considered this question. Who knew the fate of Cinderella would be changed by her shoe size? Rapunzel's big adventure not only reveals her true identity, but the dreams that would have never came true if it were not for her daring decision. What would a princess blog be without my favorite duo?! I swear they have the BEST outfits!! Who said you had to be under the age of 10 to wear your princess crown in public? To any of those who know me personally, one thing is quite clear. I AM A HUGE DISNEY FAN (almost a little obsessed some would say). I can truly say that watching Disney films and shorts as a child really nurtured my artistic abilities today. The careful care and unique vision casted, really, throughout the entire genre or company aspects that The Walt Disney Company has created inspires me. Most of us know that the foundation of this one of a kind company started with one man's ambition to make cartoons and slowly turned into the job of making individual dreams come true. A few weeks ago, I was invited by my dear friend, Paola, who had an itch to go see this season's performance of Disney on Ice which had all the Disney Princesses in it. We wore our princess crowns and enjoyed ourselves. Starting today, Disney will be celebrating their Second Annual National Princess Week. What does this have to do with Only One Mark, Inc, you ask? Well, it just so happens that we offer small wall pieces that contain an icon inspired by each Disney Princess. Below are these special wall pieces. A lovely start to a magical event. There are many Brides who celebrate their new chapter in life by infusing a theme around their Wedding. Whatever they choose is part of the experience that they are trying create in order to make their big day that much more memorable. Save the Dates are where it all began for Alysha. Alysha came across our site online and had been looking for a specific look for her upcoming nuptials. I should say that she was really looking for a specific way to compliment her theme. Her theme is inspired by the Disney animated film, Aladdin. As exciting as it is to develop ideas/items for all types of occasions, this Save the Date was truly special to bring to life. Keep a look out for more shining, shimmering, splendid details as we continue to create a whole new world of items for Alysha and other featured Brides that are planning the biggest day of their lives. Yes, let's all take the epic-ness of the title in for a moment. Let's especially pay attention to the part where the name "David Tutera" is mentioned. But I digress. Let me start from the beginning. As any Bride-to-Be, Disney Wedding Fan, or Wedding show junkie will know, David Tutera is one (if not the best) of the most talented wedding/celebration coordinators anyone can ask for. His sophisticatedly, blunt method of "telling it like it is" shocks most on his show "My Fair Wedding with David Tutera". But in the end, you can see why he insisted on the fitted lace dress instead of the puffy, tulle ball gown. So as you can imagine what happened once I was told by a Bride-to-Be that I could be added as a Plus 1 to her party to go see him at our local Macy's retail store. I was ecstatic as some of the most important pieces from our wedding in 2011 were from Mr. Tutera's first line of Wedding items. 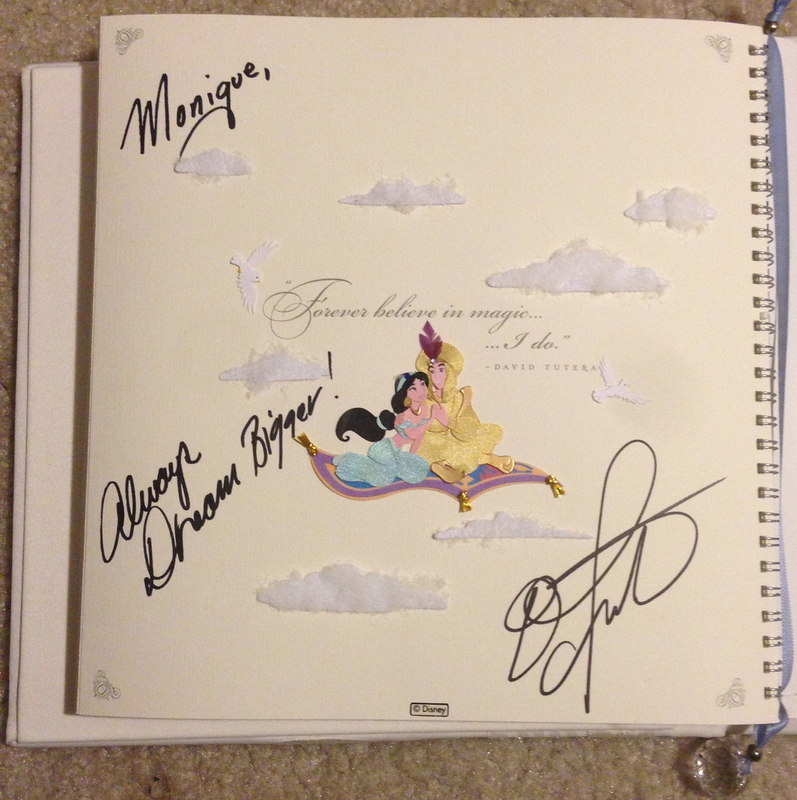 My prized "sign in" book has small inklings of Disney fairy tales and include photos from our engagement photo shoot. I almost didn't meet the famous wedding planner, but I won't go into detail of the fiasco that ensued that morning. Instead, I will tell you about how wonderful it was to watch him at his best during his presentation on the special registry system Macy's offers their Brides-to-be. He offered advice of all kinds. 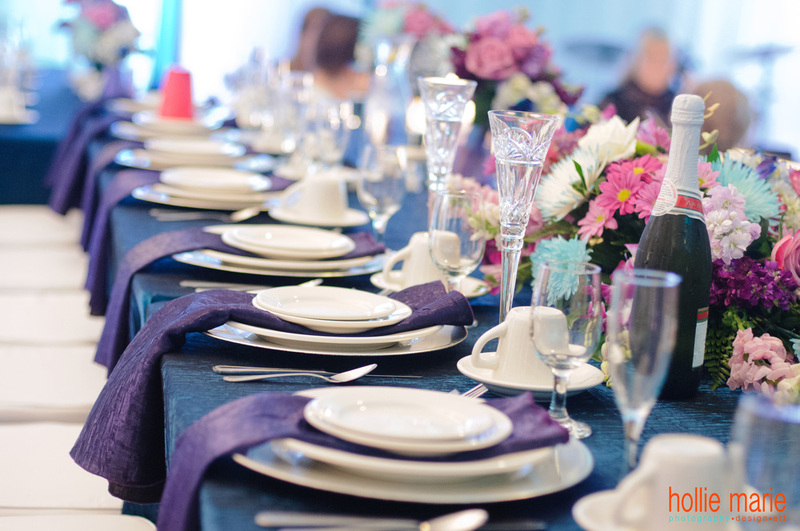 He talked about what was the best type of flatware to use in regards to occasion, the difference between pressed and natural linens, but what most affected me was something else he said. While answering a question about destination weddings, he said something very relevant to what (hopefully) those who are in the celebration business all truly believe in. 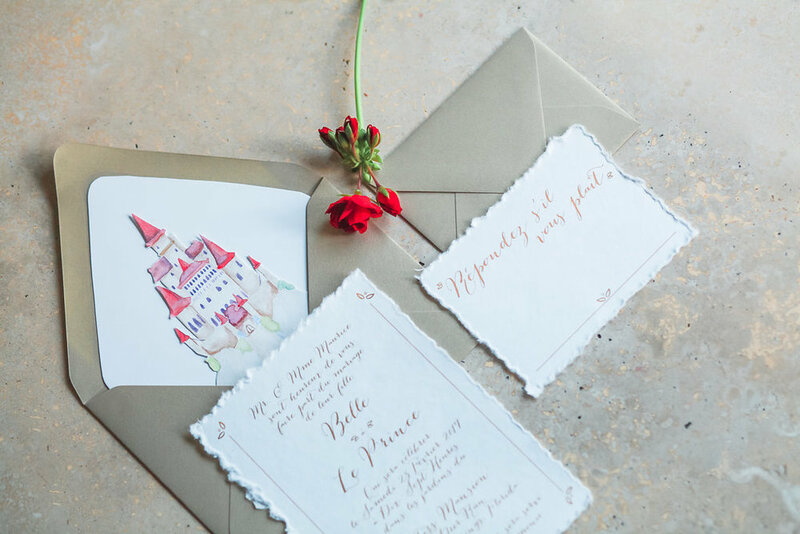 Ultimately, as a supplier of Save the Dates, Invitations, R.S.V.P.s, and other necessary items for your special day, you are sending your guests on a journey into a moment that you are creating. One that you will look back at fondly and only remember the small moments that will still make you smile. I will leave you with one (or two) last images from that day and a word of advice. Always take a chance at an opportunity when appropriate. I ended up taking our "sign in" book to the event and was able to get it signed by the man himself. :D It was very exciting to finally meet the wedding guru and (get this) have him compliment me on how nicely decorated the book was. In his words, "This turned out quite nicely. Exquisite!" Stay tuned for another blog where I'll feature some highlighted questions and answers from the event. ;) Until then..."Always Dream Bigger"
The stage is waiting for it's honored guest to arrive. This flower arrangement was elegant and was more stunning when you got up close. Yours truly beaming with excitement at the chance to meet the man himself. David Tutera had arrived and was ready to dish out tips and advice for all who would listen. I have no words except for "Epic"
Never would I ever have imagined that my wedding sign in book would be signed by it's designer.